Risk stratification models have traditionally used medical and pharmacy claims data combined with other sources, such as electronic health records (EHRs). But provider organizations often have more ready access to EHRs than claims, so they may find it easier to use only EHR data instead of claims for risk stratification. But can this data yield valid results? 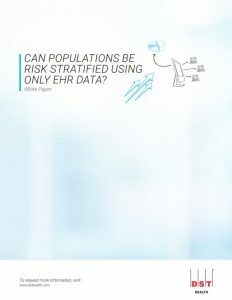 This white paper highlights some key findings from a study regarding the use of EHR data for risk stratification by Hadi Kharrazi, MD, PhD, and colleagues from the Department of Health Policy and Management at Johns Hopkins School of Public Health. Predictive modeling was completed in this study using the Johns Hopkins ACG® System.